CARDS went on a goal-scoring frenzy but were indebted to the magnificence of Bradley Bubb and Aaron Howe as Garry Hill’s men stopped the rot to claim their third win of the season in unbelievable style. Defiant Howe laid the foundations for Woking’s first win in five with a string of wonderful saves, including a second-half penalty stop from Kyle Perry. At the other end four-goal hero Bubb added to first-half strikes from Gavin McCallum and Lee Sawyer to set up the Cards’ most emphatic league win since a 7-1 hiding of Altrincham in November 1996. 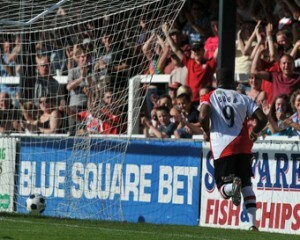 After watching his side run riot at Kingfield, Hill was undoubtedly in awe of loan star Bubb’s astonishing display. He said: “The dividing line at this level is in the final third and it is a tremendous achievement for Bradley Bubb to score four goals in one game. “All his finishes were of the highest standard and he deserves all the accolades. Andy Brown tapped in a late consolation for the visitors. Pick up Thursday’s Woking News & Mail for the full report and reaction.